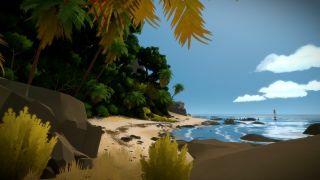 The Witness is a heck of a good puzzle game, and apparently selling quite well, which is good news for the creative future of Jonathan Blow. But it's making some people sick, too: Not in the sense of a “Wow, I can't believe I spent 40 bucks on this 3D Sudoku thing” jag of buyer's remorse, but actually feeling physically ill as the result of motion sickness. It seems to be a relatively widespread phenomenon, going by this thread on The Witness subreddit and this one on the Steam forums, and there are different theories about what's causing it. But Blow and co. are working on it, according to a pinned “Patch Notifications” thread on Steam that says an “Experimental Anti-Motion-Sickness Update” is in the works. The update enables a wider FOV [field of view], disables view bob, and increases acceleration when walking or running. The update hasn't been rolled out to the public yet, but you're having motion sickness issues and don't mind rolling the dice on a beta patch, you can opt in to the “future” beta branch and snag it now.